OilSoup: Ryan Smyth: Where's The Beef? I Mean Contract? Ryan Smyth: Where's The Beef? I Mean Contract? The madness that circles like vultures around our hero Ryan Smyth. No longer than a week ago Oiler fans were treated to swirling rumours involving Smyth. The hockey media wanted to know if Ryan was available as a rental. With the Oilers still in the infancy of their rebuild, trading Ryan would probably garnish a first round pick. Akin to the Doug Weight rental ploy, Ryan would strictly be a rental and re-sign with the Oilers this Summer. So why is Ryan Smyth still an Oiler? Is Steve Tambellini waiting for the best offer? Or is it possible that Ryan doesn't want to be moved. Forget the opportunity of playing in playoffs. Who cares about a chance of raising the Stanley Cup. Ryan just wants to stay in Edmonton, with his family, playing for the team he loves. What better story could there be? So my question to Tambellini is, why haven't you signed our hero? What are you waiting for? Sure you've been busy with the trade deadline looming. But you've known for sometime that Smyth wants to stay and not be a rental. 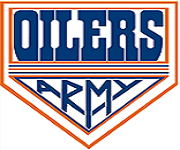 With the likely hood of this Monday being a quite day for the Oilers. Signing Smyth would bring a smile to the Oiler faithful. A glimmer of hope while we endure this rebuild. Do us all a favour and sign him Tuesday and have a big press conference. What a PR conception that would be.